Our minister acts as a guide to the church in ethical and theological matters, as a leader in worship (freedom of the pulpit is granted by the congregation) and as a friend and counselor to all who seek these services. Lay Chaplains may officiate at rites of passage such as marriages and services of union, memorial services and child dedications. From time to time, the church may host an intern minister. An intern ministry is one of the steps in the path to ordination as a Unitarian Universalist minister. Brian Kiely has been the minister at the Unitarian Church of Edmonton since September of 1997. Before that he spent nine years serving a number of congregations in British Columbia. His educational background includes a Master of Divinity degree from our Unitarian Universalist seminary, Meadville/Lombard Theological School, and a Master of Arts (religious studies) from the University of Chicago. Brian was born and raised in Montreal, growing up in a staunchly Irish Catholic family. In his young adult years he came to doubt his faith and began asking questions. His questions led him to the Unitarian Church, where he found people willing to discuss religious ideas openly and without concern for required beliefs. In 1984 after an early career in journalism, photography and a bit of theatre on the side, he found himself struggling with work-related ethical dilemmas. He became more deeply involved in church life leading to a decision to enter the ministry, an idea which first came to him at a friend’s ordination. Brian was ordained in the First Unitarian Congregation of Toronto in 1988. Like most ministers today, his education included courses in Unitarian Universalist topics as well as world religions, sacred scriptures, church history, psychology and sociology of religion and the arts of ministry. He has completed a unit of Clinical Pastoral Education, working as a hospital chaplain, and completed a parish internship in Vancouver. His undergraduate degree is in history. In the Unitarian church, there is no required creedal statement, meaning all are encouraged to work on their own personal beliefs. Theologically Brian is a ‘theistic humanist’ meaning he has a deep sense of the spirit and of the divine, but that he does not believe in a god that watches over us or that intervenes in our lives. We must rely on our human abilities to solve our own problems, and develop strong, trusting and supportive communities to help us along the way. Brian has served as editor of The Canadian Unitarian, the national publication of the Canadian Unitarian Council, and was the primary author and witness in a brief to the Canadian Senate on the Council’s position on euthanasia and assisted suicide. He has recently authored a chapter for an upcoming book on everyday spiritual practices on the subject of “Loving Partnership as Spiritual Discipline”. In November 2007, Brian was elected President of the International Council of Unitarian Universalists. 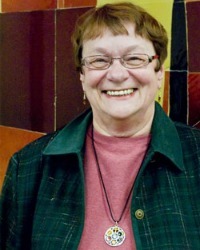 Chaplain Anne Barker Joined the U of A in September 2016. Unitarian Universalists are diverse. We work to end racism and oppression in society and to make our communities inclusive for folks of all gender identities, sexual orientations, races, ethnicities and abilities. UUs come from many cultures and class backgrounds, and we bring many spiritual practices and beliefs to our communities. I am excited to serve and grow communities that celebrate both the freedom & the responsibility of spiritual exploration & development. Together, we create the world we believe to be possible. UU’s work for justice, equity and compassion in every context and appreciate the value of diversity in religious community. Bringing UU support, sustaining practices, and a message of peace and well-being to the University population is an exciting opportunity. As an openly queer Chaplain, and someone used to bridging diverse communities, I hope to serve traditionally underserved populations – people who appreciate supportive community without the constraints of creeds or religious regulations. I’m eager and enthusiastic for a world where ‘difference’ is both safe and valued. Relationships are number one. Friends and family, meeting new people, a good conversation over a good coffee. I also love to swim, read, write and do just about anything creative. I’m queer, married, a mother, and also serve the Westwood Unitarian Congregation in Parkallen as part-time parish minister. Rev. 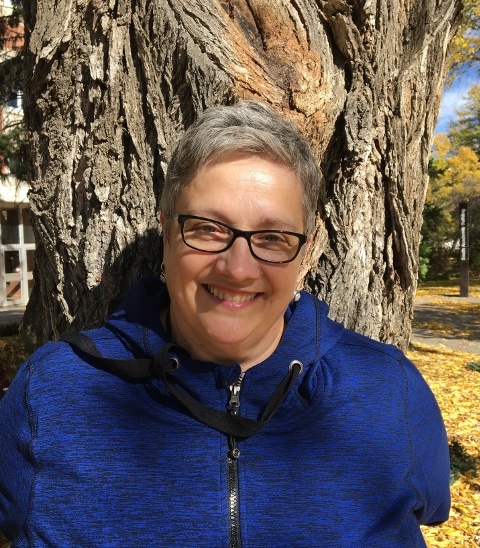 Audrey Brooks is a Unitarian Universalist campus chaplain at the University of Alberta. A longtime member of UCE, Audrey has a Master of Education degree from the U of A and Master of Divinity degree from the Bangor Theological Seminary in Maine, U.S.A. Audrey performs many marriage and memorial services.